Today I'm examining a beer from my native region, the San Francisco bay area. Anchor Brewing Company were one of the first breweries to enter my vocabulary when I first came of age, so it's fitting that I'm including a beer of theirs that I've never had before. 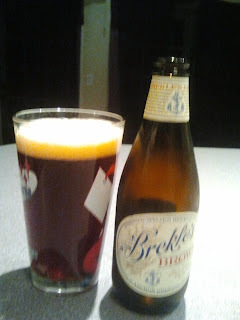 When I first turned 21, I would often go to the liquor store around the corner to grab a bottle of Anchor Steam, as I found it preferable to many of the other beers that were readily available and within my price range. I had no concept of the diverse flavors beer could have nor did I know the difference between cheap malt liquor and high quality craft beers. Still, I knew I was drawn to beers with a richer flavor, more meant for sipping than chugging. In the honor of my own nostalgia, I'm drinking a beer that is equally nostalgic for the brewery. 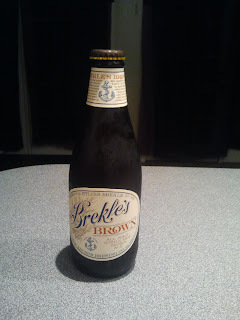 Named after Anchor's first brewmaster, Gottlieb Brekle, this beer builds on a traditional brown ale in the finest of ways. Pouring a beautiful, rich brown with a slightly foamy head, this beer's malty aroma gives little warning of the broad array of flavors that will sweep across your palate. This is instantly smooth and enjoyable, even to those without much of a taste for beer, as its darkness and thickness are contrasted nicely by an almost honey-like sweetness. There's a slight feeling of crisp, delicate bubbles on my tongue as I swallow the last of each sip, which leaves a pleasant warmth in my mouth. This beer is rather middle of the road in alcohol content for a craft beer (6%), so I imagine it would be great to bring a couple bottles of this to a social event where the goal is to have a drink in hand without getting heavily intoxicated. As with anything based on an old recipe, I really enjoy imagining that one of my great grandfathers may have enjoyed beers like this in his younger years. As somebody with a strong desire and love for relics of the past, this beer appeals to me greatly and happens to taste just as good as I'd hoped. This doesn't appear to be a particularly limited beer, but this was definitely the first time I'd seen it before. For a musical pairing, I'm listening to NPR's stream of the new Pig Destroyer album, Book Burner, which comes out today. It's also a brand new experience from an old favorite that I loved well before I understood their genre or why they appealed to me: the perfect pairing.